NASA's Cassini spacecraft captured this view of Saturn's north polar vortex on April 26, 2017. The bizarre vortex spinning at Saturn's north pole takes center stage in a newly released photo by NASA's Cassini spacecraft. The probe snapped the photo on April 26, the same day it began its "Grand Finale" phase of daring dives between Saturn's cloud tops and the planet's innermost rings. It takes Saturn about 29 Earth years to orbit the sun, so seasons on the gas giant and its many moons each last more than seven Earth years. Cassini was about 166,000 miles (267,000 kilometers) from Saturn when it took the picture, NASA officials said. Saturn's north polar vortex sits at the center of a 20,000-mile-wide (32,000 km) hexagonal jet stream whose winds travel at about 200 mph (320 km/h). 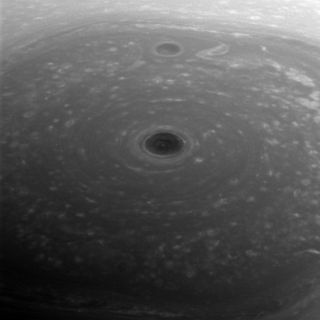 The vortex photo is too zoomed-in to show Saturn's hexagon, which resembles nothing else known in the solar system. Cassini's Grand Finale is drawing to a close. On Sept. 15, the probe — which is nearly out of fuel — will end its life by plunging intentionally into Saturn's thick atmosphere. This suicide maneuver is designed to ensure that Cassini never contaminates the potentially life-supporting Saturn moons Titan and Enceladus with microbes from Earth, NASA officials have said. Cassini launched in October 1997 and arrived in the Saturn system in July 2004.